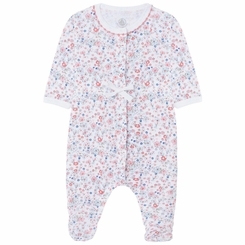 We can't resist this baby girl sleepsuit crafted in cotton jersey with an all-over floral print. Refined baby pyjamas with their flower stitch at the neckline, fine ribbon braid at the waist, elasticated ankles and back; a host of details that add a feminine touch. The poppa Y opening makes it easier to dress baby. Adorable nightwear for baby girls, which makes the perfect gift for a newborn. Material: 100% Cotton.